Here's one I "missed out" in uploading last year. This track "ignited" my passion for some of the Obscure tracks of Benny Goodmans band. I first heard it on a 3 "cassete" set from readers digest I bought second hand in the late 80's. of course for many years I wanted to hear the 78 and by pure chance I found a worn copy and hey presto here it is. what suprised me with this track compared to the versions issued on LP,Tape and CD. Is the Dynamic Range. this track on Re-Issues suffers from to much compression. IE compression makes the loud parts soft and the soft parts the same "level" as the loud bits. so when the band really "goes to town" it hasent the Impact when playing it from the original 78. This Ive corrected! and what a number. the small combo section is really "tight" and keeps it Swining!, Thaks Mr Goodman. 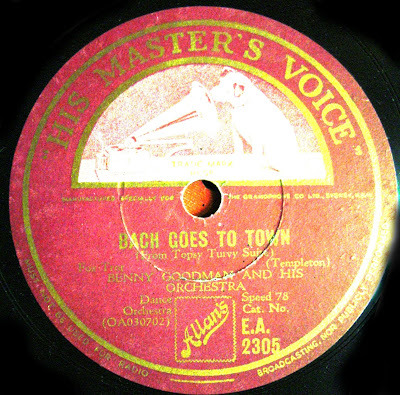 The song itself, well it's one of Benny's attempts to "Swing the Classics" in the mid to late 30's most big bands were digging out the old "scores" and finding ways to swing em up. most are good. some are dreadfull. but this track really has that "Bach" feel! in the 60's 3 French guys (Jacques Loussier Trio) swung up Bach's music. they released 4 (from memory) albums, I Really Dig the first one. If you are interested they are called "Play Bach"
BTW, The Fake Stereo Version is quite good (with headphones) and clearly "seperates" some of the instrements ! Benny Goodman - Bach Goes To Town "GOOD"
Benny Goodman - Bach Goes To Town "TMNR"
Benny Goodman - Bach Goes To Town "Fake Stereo"
First heard (and loved) this tune when I was a kid, but have never found out what it was called or who it was by til now! Cheers Ade. Sounds so vital with your restoration too. Thanks!